A short post this week, what with the table nearly set for turkey this Thursday. There's not much to say about the old Hotel Arlington, on West 25th Street just off Madison Square, at least not that I could discover from a little light Internet prowl. No sordid tales of hookers and whores, no spooky basement bath-houses, no two-timing floozies ending their days here in some torrid tryst gone awry. 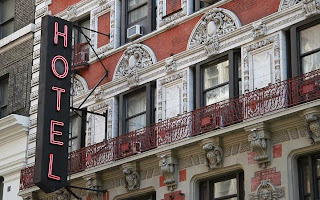 Surely no old New York hostelry worth its salt is without its share of such tales, especially those that sported big old flickering neon signs over their doorways, as the Arlington once did. But I'll leave those for someone else to find, and dwell instead on the Arlington's bygone place in New York's neon landscape. 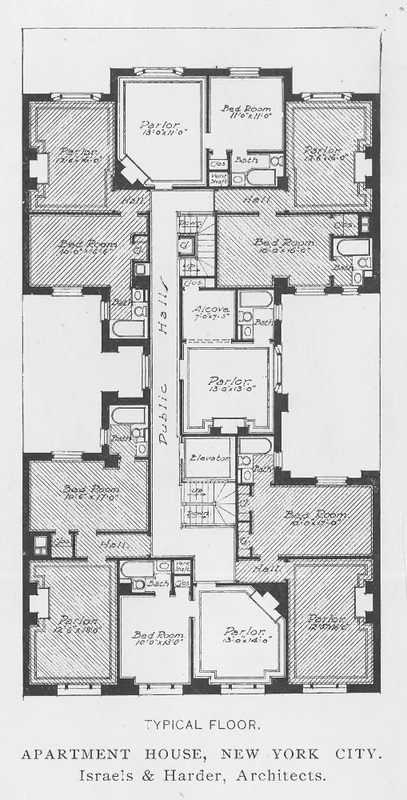 The Arlington began life back in 1901-02, as an "apartment hotel" designed by architects Israels and Harder. 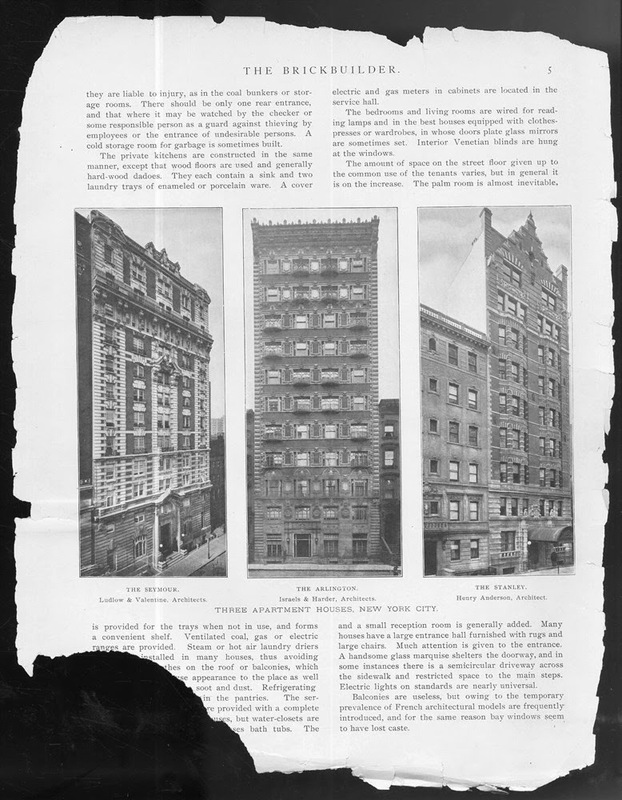 I chanced upon an old photo of its especially handsome brick and terra-cotta facade in a tattered back issue of a trade publication called "The Brickbuilder." Its construction and ownership history is thoroughly detailed over at Walter Grutchfield's amazing web site, 14to42.net. Like any number of once-fashionable hotels on the side streets around Madison and Herald squares, the Arlington became an SRO by the 1980s. As recently as a few years ago, the term "SRO" was as much a part of the New York vernacular as "stoop" or "schlep." These days I find myself constantly having to define the term whenever it rears its head in casual conversation with anyone under the age of 35 or so. 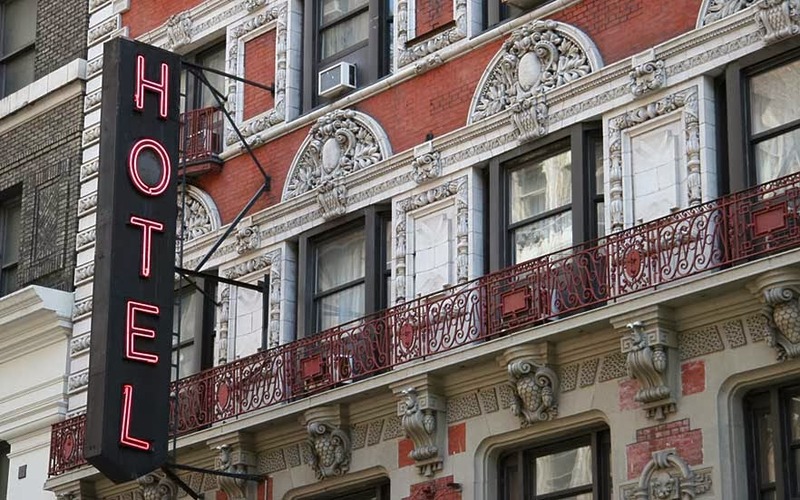 In a 1998 story on their already-waning numbers, the New York Times neatly summarized the SRO phenomena in two sentences: "Home to prostitutes, drug addicts and the mentally ill, single-room-occupancy hotels are often seen as a blight, dragging down neighborhood property values. But with tenants paying an average of $426 a month, according to a 1996 city study, S.R.O. 's have also long attracted artists, factory workers, single women, students and the elderly poor." 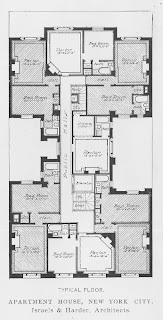 By the 1980s, increased demand for Manhattan hotel rooms led many SROs, including the Arlington, to re-convert back into conventional tourist hotels. This of course led to the displacement of all those prostitutes, artists, etc. When Mr. Grutchfield visited upon the Arlington back in 2005, he found its neon "HOTEL" sign still in place, over a marquee emblazoned with Han characters. "The Chinese seems to say Ya Ning Dun Jiu Dian (Pinyin): Elegant Peaceful Pause Hotel," writes Grutchfield at 14to42: "or, the first three characters could be Ya Ning Tun (Wade-Giles) - i.e., Ar-Ling-Ton in transliteration." By the time the Arlington figured into the backdrop of my daily commute in 2009, its neon herald had made way for signage better suited for the Interstate than the side streets of New York. Its former name survived Chinese translation, but couldn't survive the new world order of 21st Century-New York. 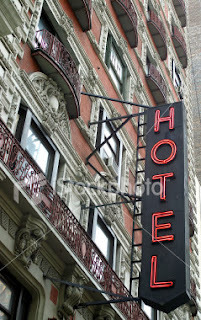 Now known as the "Comfort Inn Chelsea," it has 3.5 stars at Yelp, though one Chris B. of Boxborough, Mass bemoans its "carb heavy" free breakfast: "we walked to the NY Racquet Club for non-dairy smoothies." • Walter Grutchfield's Arlington run-down at 14to42.net. 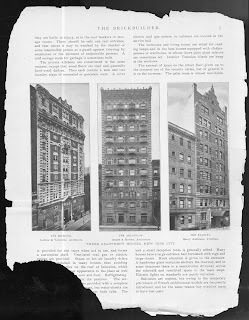 • A visit to the Arlington at the Ephemeral New York blog. • "Checkout Time?" The NYT on SROs in 1998. • A neon holiday shopping guide from ProjectNeon ~ there's a certain neon book available, if you haven't picked one up yet!